Aim: What are you trying to find out? Firstly, I want to find out if oppositely charged elements from warring chemical families—Romeo (from the Montague family) and Juliet (from the Capulets)—can form an ionic bond through electrostatic attraction. Secondly, I aim to find out if the lattice energy (bond strength) formed in this chemical reaction is strengthened, resists change, or suffers energy degradation when put under a variety of environmental pressures. Hypothesis: What do you think will happen? Romeo and Juliet are both young elements in the periodic table so their charges (Romeo: negative, Juliet: positive) are at their most potent. As they have not bonded with other elements before, the force of attraction between them will be purer and make it easier to form the ionic bond. This bond will likely have high melting and boiling points. I think the reaction will produce chemicals like oestrogen, testosterone, dopamine, pheromones, adrenaline, and serotonin that will give it more strength. By mixing the compound with other alkaline chemicals—such as Friar Laurence and Mercutio—I think the molecular structure will be reinforced. If I bring the compound into contact with opponent acidic elements—like Tybalt and Paris—I expect them to attack the compound’s new molecular properties, but I predict that by controlling environmental factors the bond can be sustained. In order to make my hypothesis, I had to analyse data from similar experiments conducted by other scientists. 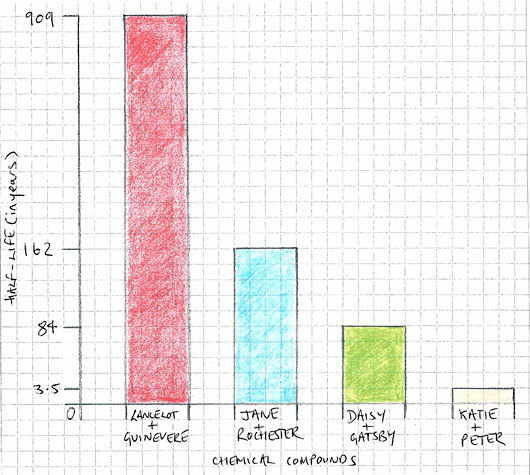 In the bar chart below (not to scale), you can see the different half-lives of compounds between pairs of elements. By analysing the properties of each ionic bond, it is possible to see which factors help contribute to a slower rate of radioactive decay. In the example of Katie Price and Peter Andre (which is comparable with the Pamela Anderson and Tommy Lee compound found in America), degradation was rapid. Chemical catalysts included silicone, latex, synthetic fibres, polyelectrolyte polymers (commonly known as hair gel), alcohol, benzoylmethylecgonine, and carbon (commonly known as diamond). In the example of Daisy and Gatsby, the bond was covalent, which means one or more pairs of electrons are shared by two atoms. 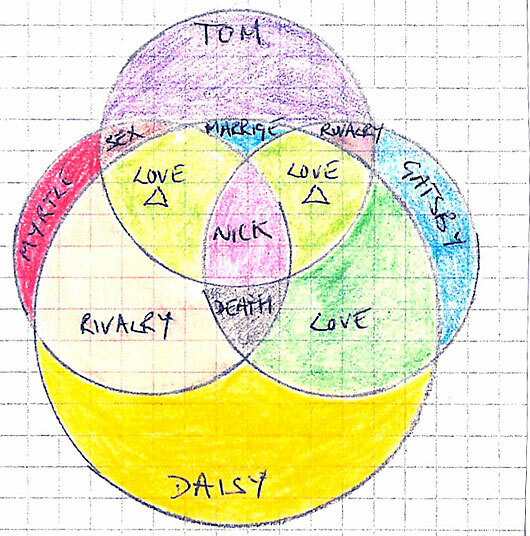 In this case it was Daisy who was shared between Tom and Gatsby and Tom who was shared between Daisy and Myrtle. This formation, as shown in the Venn diagram (below), weakens the bond so speeding up its degradation. In the example of Jane and Rochester, the ionic bond between the opposite endothermic and exothermic elements was complimentary and ignored their class within the periodic table, which can sometimes act as an obstacle to bonding. An electrostatic attraction enabled the immunity of the Jane element to the volatile and easily combustible Rochester element. In the example of Lancelot and Guinevere, reaction was created by a triangulation of the two elements with a third element called Arthur, similar to the way a reaction occurs in the fire triangle (oxygen + heat + fuel = fire). The bond was the product of one of the first experiments of its kind, and this is what has given it longevity and its status as scientific precedent. Did your preliminary investigation affect the method or range used in your final investigation? If so, how? 1: Youth: In the most durable of the bonds—Lancelot and Guinevere—the elements were aged 18 years. I decided to experiment with even younger elements (14 years) as prior testing proved them to be more malleable. 2: Obstacle: For particles in the elements to be accelerated enough to generate the energy needed to form a bond, a primary factor was overcoming an arbitrary obstacle, such as element class or molecular marriage. As neither was present in the Romeo and Juliet combination, I varied it to “competition from a rogue element for the magnetic attractions of Juliet.” I chose to use the element Paris in this context as it would be interesting to see if it were a catalyst for deeper fusion or bond breakdown, as in the case of Daisy and Gatsby. 3. Polarities: In the case of Jane and Rochester, their opposition as elements created a more powerful fusion. This was accounted for by the fact Romeo and Juliet were from different chemical families. I ensured the variables of food, drink, sleep, and clothing remained constant throughout so as to be sure that variations in behaviour were not influenced by these factors. The only lesson learnt from the Katie and Peter (Pamela and Tommy) bond was not to bring the Romeo and Juliet elements into contact with any of the chemical catalysts present in this bonding. figure 3. 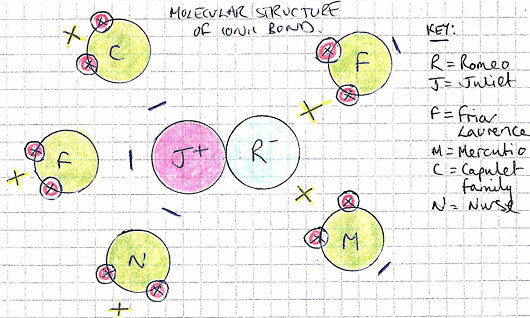 The above diagram illustrates the structure of the ionic bond I worked with. I conducted this experiment over six days to test the strength of the bond over time. I also tested the strength of the bond in eight distinct environments: The Ball, The Balcony, Holy Church, A Public Place, Consummation, Exile, Poison Plot, The Tomb. This was so I could collect data on the behaviour of the elements when in contact with different stimuli and draw a fair conclusion on the strength of the ionic bond. This was the environment I cultivated for the first collision between the two elements. It was designed to test their electrostatic attraction to one another based on their own chemical charges at that point in time: good looks, youth, a beautiful dress and a taboo. In order to ensure a fair test, the elements were dropped in at the same time amongst a crowd of other elements, particles, cells, molecules, atoms, neutrons, and electrons. In other experiments, these factors have distracted elements from coalescing. In Romeo (negative charge) and Juliet (positive charge), I observed an instant magnetic draw that pulled them through the crowd and into each other’s orbits; they swapped electrons at first collision. This collision generated electromagnetic shocks that agitated the other elements in Petri Dish 1. The objects of analysis—Romeo and Juliet—separated off, but Tybalt, and others in the Capulet element family, formed a radioactive attack atom to attempt to halt the formation of a chemical bond between them. In order to limit interference with the chemical reaction, I removed Romeo and Juliet from the now-contaminated Ball and placed them into The Balcony. Here, different gravitational pulls were exacted on each element as a means to test the strength of the constituent elements and analyse if they were suitable partners for a compound. Less robust elements have exhibited torsion in this moment but the evidence of soliloquy, lyricism, and metaphor were active accelerants in this reaction, which created a strong base polymer. After the polymer compound was formed between Romeo and Juliet at a molecular level, it needed to be reinforced structurally. This required movement to the third petri dish, the Holy Church. Here, a process of solidification was achieved by mixing the elements in the chemical catalyst Friar Laurence, who acted as a solder. The vows present in the nucleus of the Friar soldered the vectors of Romeo and Juliet and strengthened the polymer more. In order to test how ductile or brittle the new polymer was, it was necessary to observe the behaviour of the Romeo and Juliet elements in the presence of other chemicals that have high valences and a history of volatile reactivity. I used a miniature thermal lance to split the polymer into two parts—a new Romeo element and new Juliet element (though it was a superficial separation, as their ions remained fused in both parts). The first test of strength was to put the element in contact with Tybalt again. Goggles were needed at this point to protect from any chemical spatter and preserve the safety of the experiment. The new Romeo (empowered by the bond made with Juliet) induced a violent exothermic reaction in Tybalt, which caused Tybalt to burst into flames. I added Mercutio to counteract the impact of Tybalt on Romeo, but Mercutio evaporated on contact and formed a noble gas. This transition did, however, weaken the valence of Tybalt, and Romeo, after absorbing Mercutio’s released particles by osmosis, strengthened to a degree that displaced Tybalt. The impact was so great that Tybalt was ousted from the petri dish and repelled by the Juliet ions, despite being part of the same Capulet family of elements. I concluded that the polymer was ductile rather than brittle. Having activated a rebellion within the Juliet element against her chemical heritage, it was now time to reunite Romeo and Juliet as a compound and test it in the highly reactive substance libido, which can cause some chemicals to disintegrate on first contact. As a gas, it is known to behave randomly and expand rapidly as it warms up, leading to a quick explosion (the breakdown of the forces of attraction between particles). As Romeo and Juliet were novice elements in this chemical field, I measured just 10mL into the petri dish; this was also to ensure that the volatile elements in the Capulet family were not awakened. The nuclear reaction generated oxytocin and vasopressin and created a much more durable composite of Romeo and Juliet: the love atom—Jumeteoriol. As Jumeteoriol could not survive living solely in the Consummation petri dish, and, as there is not an endless supply of libido on the planet, the next task (to test the strength of the love atom) was to attempt to forcibly break the bond between the particles through a process of atom smashing. In order to break the matter of Jumeteoriol apart and siphon off the Romeo elements so I could analyse its subatomic makeup, I used a basic particle accelerator. Maintaining the temperature of the lab at a Verona level, I constructed a cyclotron using a ruling Capulet and a ruling Montague magnet, separated by a small gap. The magnets produced a circular magnetic field, and an oscillating voltage created an electric field across the gap, which accelerated the particles until they smashed apart. I preserved the Juliet radiation in a test tube filled with a liquid suspension of despair and hope, and siphoned off Romeo into the Exile petri dish. In both the test tube and the petri dish I placed a pipette full of Paris—an element known to agitate the Montague family of elements and fuse instantly with the Capulet family. I wanted to test if those reactions still applied now that the Romeo and Juliet compounds had been varied by their contact with one another. Severe agitation was observed in the Romeo element, and the Juliet element built a resistant force field around her that repelled the Paris element. The next stage of the experiment involved the ancient science of alchemy, in an attempt to see if Romeo and Juliet could overcome the warring tendencies of their element families and transmute into one of the Earth’s most rare substances: gold. To achieve this I distilled Juliet from the test tube using the chemical Poison Plot; this separated her off as a gas, which I held in the alembic tomb for forty-two hours. I sent an electrical impulse to the Romeo element, still in the Exile dish, to stall any chemical reactions in his element for the same forty-two hours, before I could reunite their bases. But Romeo was too agitated for the electrical impulse to find the right target and, after a few failed attempts, my equipment short-circuited, meaning the impulse never reached him. This unforeseen failure meant I had to change the next step in my experiment. My only means of continuing the experiment was to add Romeo prematurely to the alembic tomb to see if alchemy could be induced between the elements early. Romeo reacted in a very volatile manner to Juliet in gas form and developed a self-attacking suicide cell, which caused him to sublimate and release poisonous fumes that awoke Juliet’s molecules. Though sublimation is known to create a powerful emblematic state, the resultant substance can often become cryogenically frozen. This is what happened to Romeo and, as the temperature of the alembic tomb dropped so low, the vessel split under the pressure. This created a big bang effect that sent glass shards flying across the lab. Fortunately, my goggles protected my eyes, but some sliced through the Juliet compound, releasing a red liquid containing lots of iron. When this substance came into contact with the frozen Romeo, it transformed unexpectedly into a waste substance. What did you find out from your experiment? Is there a pattern to your results? In each petri dish, I took readings to measure the strength of the bond between the oppositely charged chemical elements Romeo and Juliet. 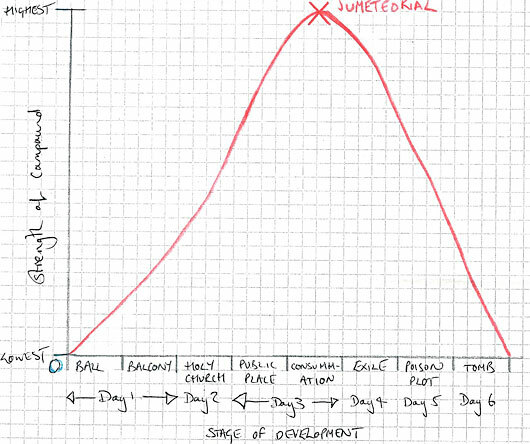 From the line graph (Figure 4), you can see that the trajectory of the Romeo and Juliet bond over the six-day period approximated that of a parabola curve, a form often observed occurring naturally in the physical world. The strength of the bond in the first three days of the experiment improved rapidly, as demonstrated by the curve rising at an exponential rate. A peak in the bond strength occurred in the Consummation petri dish at the end of the third day. This is the point when the most durable ionic bond and compound Jumeteorial was generated. As you can see from the graph, this only lasted for about twenty minutes. After this point, the pattern of exponential growth took a downward turn as the compound was tested in less stable chemical environments and with changed variables: Exile, Poison Plot and The Tomb. The strength of the composite could still be considered highly resilient directly following Consummation and during Exile, as shown by the resistance to the Paris element, but the forced separation of elements achieved by smashing the atomic structure caused particles to behave in unpredictable and erratic ways that counteracted the strength of the bond. This was not helped by my equipment breaking in the second-to-last Poison Plot petri dish, which meant that in order to attempt alchemy I had to transfer the Romeo element to The Tomb petri dish before the scientific process had been properly completed. Once the Romeo element began attacking its own cell structure, chemical reactions occurred that I did not anticipate. Although the final substance produced after the explosion of the alembic tomb was in part a composite of Romeo and Juliet and had the material consistency of a statue, it was wasteful and opposite to the dynamic element, Jumeteoriol, that proved to have the highest bond strength. The final substance was so brittle, because the lattice energy was so poor, that it could easily be shattered into tiny pieces. Can you explain this using scientific knowledge? This was another example of failed alchemy. Throughout the history of science, transmutation techniques have failed when alchemists unwittingly made unstable chemicals. How do your results relate to your original prediction? The first half of the experiment went as predicted. The youthful and oppositely charged elements generated a potent electrostatic attraction and bonded instantaneously. That ionic bond got progressively stronger as I experimented with complimentary chemicals that aided the fusion. As I predicted, the introduction of elements that would work to counteract the bond created the opposite effect of strengthening it. By smashing the atom and putting the compound through its most difficult test, I expected to be able to regulate the behaviour of the bond and sustain the compound so I could perform alchemy and produce gold. This proved impossible. Are your results good enough to support a firm conclusion? Explain. My data collection is accurate and reliable and is supported by some of the similar scientific experiments I cited in the bar chart in Figure 1. My results support the theory that youthful and oppositely charged (or tabooed) elements from warring chemical families generate powerful electrostatic attractions. The half-life of this attraction (ionic bond) is then dependent on environmental factors and interaction with other chemicals. The results of this experiment determine that an ionic compound flourishes best in a consummation environment. The difficulty with maintaining this state of Jumeteorial is that the primary element that generates it—libido—is a fossil fuel and there is not an endless supply of it in the universe. Since the point of consummation is also not repeatable in any one chemical bonding experiment, I can conclude that the only outcome after this peak is a degradation of the bond. Certain forces can be exerted on the bond to attempt to sustain it, but the self-destructive properties of a composite element can make it difficult to control in a laboratory. The paradox I discovered in this experiment is that elements whose properties enable a forceful bonding also contain within themselves the ability to self-destruct. Can you suggest any ways to improve your experiment? Could you do another experiment to make your conclusion more reliable or to obtain extra evidence? The turning point of the experiment occurred when the electrical impulse did not reach its target and my equipment short-circuited. This created dramatic and unexpected behaviour in the elements. I may repeat this experiment with new machinery by pairing the elements Troilus and Cressida, as well as Antony and Cleopatra, to see if I get different results.